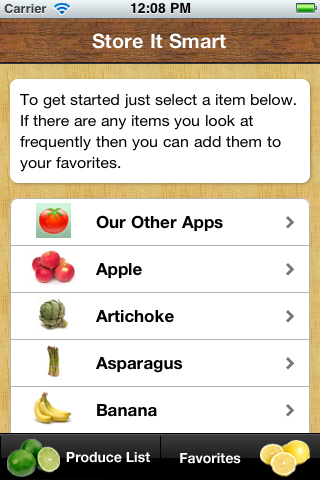 as the Store It Smart App! 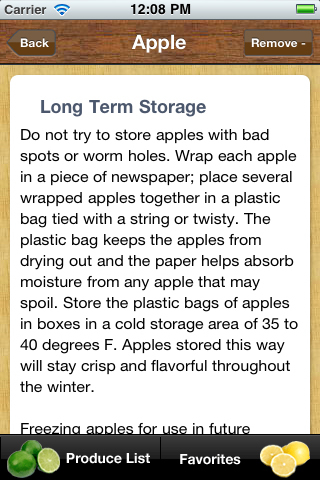 Are you tired of watching your fresh fruits and vegetable spoil too quickly? 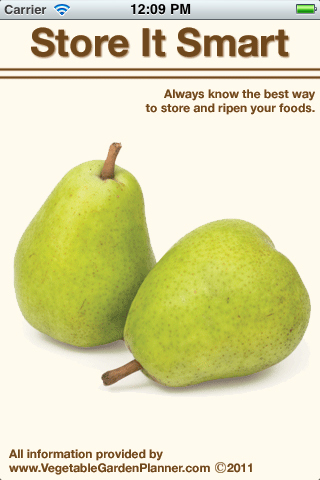 Can't seem to ripen those great peaches you got from the farmers' market? Store It Smart will come to your rescue! - Even a place to add your own notes! 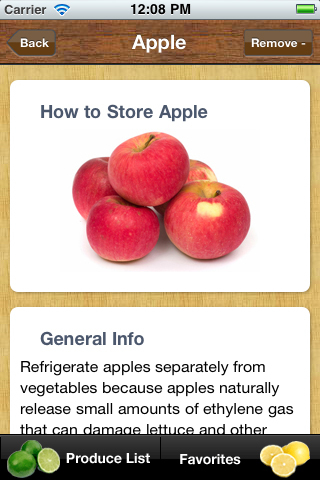 To purchase the Store It Smart iPhone app you can go to the iTunes store: Store It Smart, or you can search on your iPhone in the app store for "Store It Smart" and look for our easy to find icon! To purchase the Store It Smart Android app you can go to the Android Market: Store It Smart, or you can search on most Android Markets for "Store It Smart" and look for our easy to find icon! 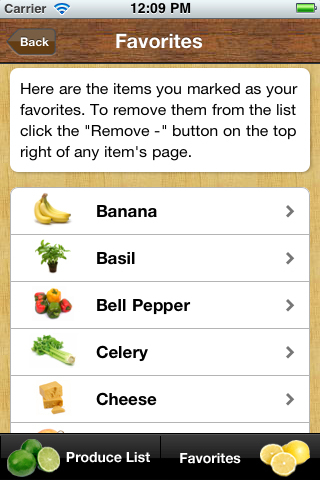 And you can add any of your commonly used items to your Favorites for easy access later! The full list of items we currently support is Apple, Artichoke, Asparagus, Banana, Basil, Bean, Beet, Bell Pepper, Bread, Bread Crumbs, Broccoli, Brussels Sprout, Cabbage, Carrot, Cauliflower, Celery, Chard - Swiss, Cheese, Cherries, Chocolate, Cilantro, Coconut, Corn, Cucumber, Egg, Eggplant, Endive, Fennel, Garlic, Grapefruit, Green Onion, Greens, Honey, Leek, Lemon, Lettuce and Salad Greens, Lime, Mango, Melon, Mint, Mushroom, Nut, Etc., Okra, Onion, Orange, Oregano, Papaya, Parsley, Parsnip, Pea, Peach, Pear, Pepper - Hot - Jalapeno, Pepper - Hot - Poblano, Pepper - Hot - The Rest, Pepper - Sweet, Pineapple, Plum, Pomegranate, Potato, Pumpkin, Radish, Raisin, Raspberry, Rhubarb, Rice, Rosemary, Rutabaga, Sage, Spinach, Sprouts, Squash - Summer, Squash - Winter, Strawberry, Sweet Potato, Tarragon, Thyme, Tomatillo, Tomato, Turnip, Watercress, and Yams. If you have more suggestions we should add please let us know and we'll work on adding it right away!